Damage is *very* dependent on the exact track and rain totals. 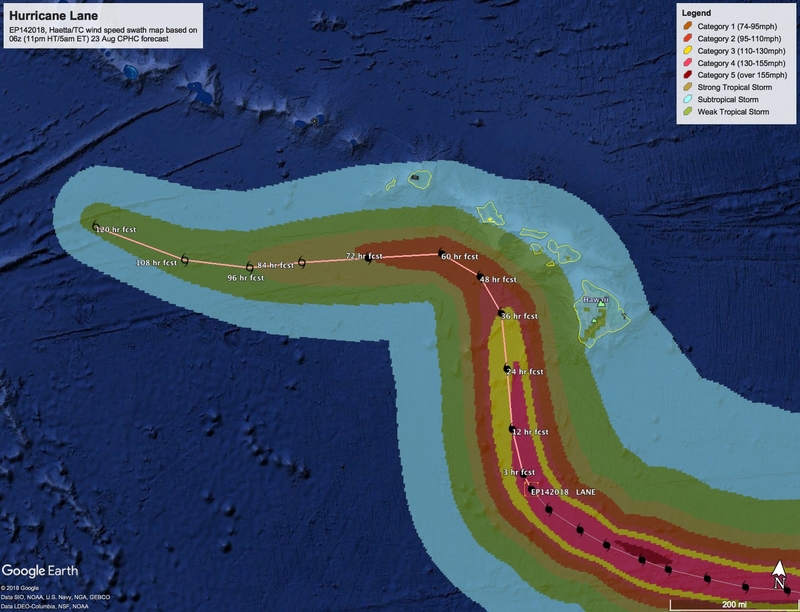 Wobbles one way or the other matter a lot in this case, and exact timing of the sharp west turn can cause the damage to change by a factor of ten for only a 20 or 30 mile further north track shift, since it causes impacts on the densely developed south coast of Oahu to come in to play! If you include economic impacts, the impacts are already in the 10’s of millions of dollars due to preparations, tourism, etc. The long term impacts (once things settle out, some impacts will be recovered) will likely be in that range, but if the storm shifts even a little further north, or something breaks that shouldn’t, impacts in the 100’s of millions are very possible. While we’re obsessing over Hawai’i, we shouldn’t forget that Japan – where flooding has killed hundreds this year – is being dumped on by another Typhoon, and and South Korea is being hit today as well. This entry was posted in Tropical Cyclones by blogoadmin. Bookmark the permalink.